Cable gets under fresh pressure in early European trading on Thursday after brief recovery attempts in Asia were capped by 100SMA (the action repeatedly closed below 100SMA in past three days). Wednesday's bearish candle with long upper shadow marked strong upside rejection (falling 10SMA capped upticks) and weighs. Strong bearish momentum adds to negative outlook, but bullish divergence on daily stochastic may slow bears. Overall picture remains negative and favors selling upticks (ideally under 100SMA) with extended upticks to be capped by converged 10/30SMA's (1.2930). 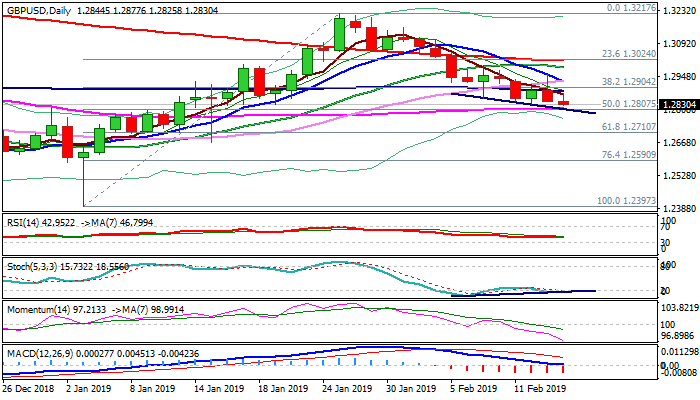 Bears eye initial targets at 1.2812 (55SMA) and 1.2786 (daily cloud top, as cloud twists next week and remains magnetic), with stronger bearish acceleration to look for test of 1.2710 (Fibo 61.8% of 1.2397/1.3217).